And dressed to the nines. One drink leads to casual conversation–she’d recently been canned and I’d just attended my ex-fiancée’s wedding. Three drinks leads to getting a little closer–I slide a hand on her thigh and my fingertips under the hem of her skirt. Five drinks leads to a proposition–a hotel room and nothing more. After an unforgettable night, I wake up alone and pissed as hell. That Sarah would jeopardize everything I’d worked for. For someone that used to hate reading let’s just say that today I’m addicted. I used to say that reading was a waste of time and the fact that I hated the smell of books was another minus point to add to that reason. But after 3 years of reading non stop I’m a goner. The fact that knowing new authors, authors that take our opinions in consideration was a way to make me want more and more. Kim Karr is one of the authors that made my love for book flourish and her books held me hostage. Her writing is hot and sassy, sweet and heartfelt with a few bumps on the road. Come a Little Closer is her latest release and tells the stories of Sadie and Jaxson. Sadie is a lost girl trying to find her way, but how can she do it? How can you become a better person when you don’t have the strength to do so? Losing her job was the first step in that direction but how can you move forward when your past keeps bringing you down. Superb plot, super engaging and intense, with some hot stuff into the mix. The interation between the characters started in a way but with every flip of a page you could witness the change. The story progressed in a way that made me smile, cry, get really mad or in love. How can broken person start to heal? I wanted to get into the book and shake some characters or hit them all at once… Things were happening and I felt helpless. This book presented us with love, friendship, desire, second chances as well as betrayal, deceive, lies and punishments. 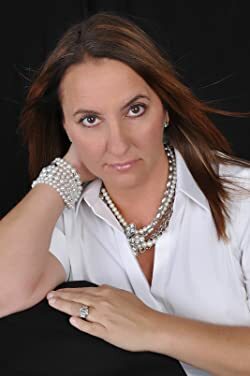 Kim Karr is a New York Times, USA Today and Wall Street Journal Bestselling author. She grew up in Rochester, NY and now lives in Florida with her husband and four kids. She’s always had a love for reading books and writing. Being an English major in college, she wanted to teach at the college level but that was not to be. She went on to receive an MBA and became a project manager until quitting to raise her family. Kim currently works part-time with her husband and recently decided to embrace one of her biggest passions–writing. Kim wears a lot of hats! Writer, book-lover, wife, soccer-mom, taxi driver, and the all around go-to person of her family. However, she always finds time to read. One of her favorite family outings was taking her kids when they were little to the bookstore or the library. Today, Kim‘s oldest child is seventeen and no longer goes with her on these, now rare and infrequent, outings. She finds that she doesn’t need to go on them anymore because she has the greatest device ever invented–a Kindle. Maritza and Isaiah meet while she’s working at a diner known for its pancakes. When Isaiah leaves a lasting impression (not so positive) and a generous tip, Maritza thinks she’s seen the end of him. Until a fender bender leads them back into each other’s orbit, and a concert alters their course. Maritza, being the outspoken and honest person she is, decides she wants to know more about this brooding, silent soldier. She decides that they will spend a week of Saturdays together – a week just hanging out, doing fun “Saturday” activities, and enjoying each other. Even with the attraction that floats between the two, they’re both determined to let go once Isaiah is deployed again … at the end of the week. This story was interesting. I loved all the characters, especially Maritza’s grandmother! I enjoyed most that each character’s personality would really shine through, and they all had their own voice. I did kind of want more from the story, but then again I can be a bit greedy. Overall: laughter, love, friendships, family ties, secrets, a bit of intrigue, and a pretty interesting community. Coming April 3rd from Kindle Worlds and the world of NYT and USA Today bestselling author, Aurora Rose Reynolds. See how the Mayson clan began. You’ve read their sons’ stories, now it’s James and Susan’s turn. Experience the boom all over again in this action-packed novella of insta-love and suspense from Author CP Smith. The Happily Ever Alpha Kindle World was created with the world of Aurora Rose Reynolds at the background. Each story is written by a different author and brings to light either a crossover from their own series into this world, or one of the unsung characters not given their own story by ARR. I was suuuuuuper nervous about this story. Susan and James … they started it all! They’re the reason we have this entire world! I wanted their story to be perfect and to really reflect all the feelings I had as I watched the Mayson men find their “boom.” Let me just say, CP Smith did NOT disappoint! Susan meets James on the side of the road when she blows out a tire. From the instant they met I felt the connection through the words. I was already in love the first time he said “baby.” I can’t believe how great the chemistry flowed between these two. Also, the banter! Susan has the biggest heart, but goodness, she doesn’t let James get away with his shenanigans … well, mostly. You know those Mayson men. This book gave me all the feels, added in a little mystery, and overall added a vibrant and beautiful history to the Mayson clan. The family was represented well, and now that I’ve read this, I’m not sure I could imagine a different, or better, love story for these two. I’m now going to be hunting down all of CP Smith’s works to add to my TBR! So, this Happily Ever Alpha Kindle World was created with the world of Aurora Rose Reynolds at the background. Each story is written by a different author and brings to light either a crossover from their own series into this world, or one of the unsung characters not given their own story by ARR. This story was short & sweet and … HOT! Brian is a crossover character from the Club Alias series and is a mercenary & one of four Doms who own a club. In this story we get to see him go on a mission to Nashville, overlapping with some work Justin, Nico, and Kenton to discuss just which criminal he will be pursuing. On this mission, he bring Clarice, a woman who is not only his best friend, but also the woman he loves. Unfortunately neither he nor her have ever admitted this to each other, so right now they’re just … friends with some extensive benefits. You get a little action, a bit of intrigue, and some smoldering scenes. I have to say THIS WAS NOT ENOUGH! Will Clarice finally admit she’s in love with Brian?! Another fantastic addition to ARR’s world! I am loving these crossovers! This is a Carpino crossover novella by Brynne Asher written for the Happily Ever Alpha Kindle World of NYT Bestselling Author, Aurora Rose Reynolds. With this story, I fell head over heels for Avery & Link within the first chapter. I can’t even tell you what it was, but I was just drawn to them from the start. Once they started actually interacting and their story began to unfold … “The beginning? Holy hotness and tattoos.” Avery couldn’t have said it better! “I never knew it could be this good. Until Link, I had no idea how rich life could be. Want to check out the ENTIRE Happily Ever Alpha World? I can’t even tell you how excited I am for this world! There are so many great authors involved, and so many that I haven’t read yet. This is a short and sweet love story that encompasses everything that this world represents. Cora and Xavier have known each other for years and are best friends. When Xavier heads off to serve, he leaves Cora behind without telling her that he loves her. Now these two are both stuck wondering how the other feels and contemplating if they should spill the beans. When Xavier comes home, all bets are off. He is all in and decides he’s just gonna go big and hope that Cora feels the same. This story is TOO SHORT! I wanted more! Cora and Xavier are adorable. Their story is super sweet, but has just enough hot to satisfy. I love these two and wish that I could’ve seen their whole journey together! They begin the list, together. Unbeknownst to Poppy, she is actually beginning to open herself and her heart up again. So when she begins to feel that spark, you know that beginning of a relationship butterflies and giddiness, with Cole … let’s say, she doesn’t just roll with it. She pushes it back, denies, focuses on anything and everything else to make sure it doesn’t become something more. Her brother recognizes the signs, though. This book took me on a ride. Seeing Poppy’s pain and genuinely broken heart, well it gutted me. Her devotion to Jamie, even after his death, was something so admirable. Then, even with this devotion, recognizing that she was moving forward and that she could love someone else and not forget her love for Jamie, oh man … that moved me. This book was something beyond just good or great. It’s not just a love story. It’s a story about healing, learning to lean on others, recognizing the good and bad in life, and embracing all of life’s twists and turns. Read it. Oh my gosh. The depth of this book completely caught me off guard. I’ve read many stories relating to addiction, and if you know me, you are aware of my love (aka obsession) regarding crime, murders, the drug trade, and the like. Any time a story relating to those topics crosses my path, I go for it. What I love most about fictional stories is the ability to get the chance to relate to the struggles those with an addiction face. I can’t say I’ve ever faced anything like that, so I love being able to admire their strength, resilience, and drive. Affton and Cable meet in high school, but run in rather different circles. Cable is THE MAN on campus, and Affton is just a new girl forced to move during high school. All she wants to do is get through in order to get to better things. Unfortunately she couldn’t ignore the signs that Cable was headed down a dark path, and she got herself caught up in a way that would alter her life. Because of stepping out and speaking up, she got herself chained to this boy and his mess for an entire summer. During this summer, Affton realizes that Cable’s issues are not just related to his addiction, there was so much more to him that she had imagined. It’s in this time that she, and Cable, realize there may be more here than they’d imagined. The beauty, is, that this is more than a simple romance – Affton is so strong, her heart is amazing, and she just takes no crap from anyone-especially Cable. Cable, on the other hand, is a HANDFUL. He doesn’t want a babysitter for the summer, he doesn’t want Affton in his business, and he definitely isn’t willing to share the storm that’s raging inside of him. “I thought she would heed the no trespassing signs, but I underestimated her need to save the unsavable. She danced around everything I threw at her like a goddamn ballerina. She pushed just as hard as I pulled…” Cable realizes there’s so much more to Affton. This story seriously pulled me in all the directions. It gave such a beautifully heartbreaking picture of the struggles surrounding addiction, and brought to light all the things that can go alongside addiction. Life is never the same for any two people, and there isn’t always a clear reason why people make their choices – this story truly shows all of those angles. This quote … this is the story. Everyone has some broken in them; some people it’s easy to see their brokenness, while others hide it with every fiber of their being. This story needs to be told, and we need to take the time to understand what people are suffering before we simply take in their outside facade.